Betsy Brooks, The Descendants of Marie Ferree organization's History Coordinator (European) recently traveled to France and Germany. While there she had opportunity to visit areas where Daniel and Marie Ferree are known to have lived and worked and was able to research available records which provided information pertaining to the early life of the Ferree family in France. She writes about her experience and findings below. Prior to coming to the "Isle of Pennsylvania" the Ferree family endured monumental oppositions. There is never a time that I don't marvel at their faith and perseverance. Our daughter lives in Germany, we travel there quite often. 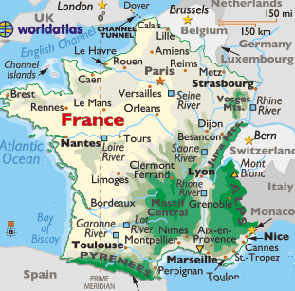 While there we, of course, go into Strasbourg and other French and German cities. As I walk down the streets and along the banks of the Ille River and see the swift currents of the Rhine, I wonder what our Ferree family saw and felt. Let me state what we DO know. Daniel was born in 1650 in the Normandy region and Marie was born in 1653 in the Picardy region. At the time of their marriage, Daniel was 19 years old and Marie was 16 years old. Daniel and Marie were most likely born Catholic and converted to Protestantism. We know that Daniel changed his name from John to Daniel after his conversion. Six children were born to this couple. Daniel, Catherine, and Mary Catherine were born in Landau in 1676, 1679, and 1683 respectively. Jane and John were born in Lyon in 1682 and 1685 respectively. The baby of the family, Philip, was born in 1686 in Steinweiler. Since I have been to Steinweiler and Landau, I know just how close they are to each other. There are about seven miles separating there two locations. Billigheim and Rohrbach are within three miles of each other. These small villages form a triangle just southeast of Landau. But knowing how far Lyon is, I have ask myself the question of why Jane and John were born so far from the other towns. After reading about the silk trade in France, I discovered the answer to my question. During the reign of Louis XI he established Lyon as the silk production center for France. Silk coming from Italy and Asia was so expensive he did this to save money for the wealthy of Europe who were the only people who could afford silk at that time. By 1591 Francois I allowed Lyon to control the monopoly of all the silk production. Lyon continued to be the producer of silk for over two hundred years. It was because of the silk hub that Daniel and Marie went to Lyon and there Jane and John were born. I have yet to go to Lyon to check records there. Perhaps that is the trip for next year. Their permanent home and business was located in Landau. A French lady I hired a couple of summers ago told me that most likely Marie and the girls sewed and/or embellished the beautiful silk fabrics and the boys were being trained for the business. After the Edict of Nantes, 1685, many small towns and villages in the lower Palatinate region were burned and totally destroyed by the King's dragoons. (Because the Alsace-Lorraine areas had been tossed between Germany and France, let me add that it wasn't until after WWII that the lines were finally established.) The family then relocated to Strasbourg at some point after John had been born in Lyon in 1685. Lyon is 238 miles from Strasbourg, therefore, they had a long way to travel with a young child. I think they most likely traveled by river. 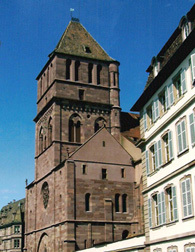 We know they attended the Eglise-Saint Thomas Protestant Church in Strasbourg. They most likely attended the Cathedral Notre Dame until 1681 when Strasbourg was annexed by France and the Catholic Church took the cathedral from the Protestants. Up until then Strasbourg was in Germany. I think they could "hide" to a degree in a large city. While in Strasbourg they met a young couple Mathias and Catherine Schleiermacher. They were also Protestants and trying to leave the persecution of the French. Another young Frenchman, Isaac Lefever was also trying to flee the city of Strasbourg after his entire family had been killed by the King's dragoons. It is possible that all of these people met and knew each other from the church in Strasbourg. River Ille, Petit de France, where Daniel would dock. There were never any business records or stores located in Strasbourg. We DO know that Daniel had a boat. Since he traveled down the Rhine, we think the boat was probably large enough to have living quarters and store his silk goods. 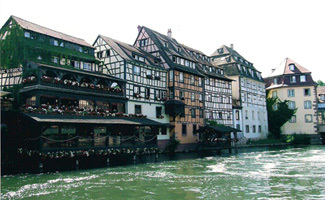 We know that he docked his boat in the Petit France district in Strasbourg along the River Ille. He showed his silk merchandise in the Kaufhaus on the banks of the Ille. He could have also sold directly from his boat. Today the Kaufhaus in Strasbourg is a very nice restaurant. By the way, the French words for Kaufhaus are Ancienne Douane. The French lady from Strasbourg told me that she had read so much about the silk business while researching Daniel's business. She was not aware of the French silk industry. Marie Odile has been a great associate for me. Her English is wonderful and one perk is that her husband is a city architect for Strasbourg. Every time I see the Petit District, the River, and the old Kaufhaus, I think of our family and swell with tears. I can't imagine what this family endured. What we DON'T know is where and how Daniel died. Perhaps I will find some information that answers these questions. We know that his death was after 1686 but before1708. It is probable the family took a boat down the Rhine to Karlsruhe, Germany where they lived for a short time then appear to go to Steinweiler. We also know that Daniel Ferree, the oldest son, married Anna Maria Leininger in Steinweiler in 1701. 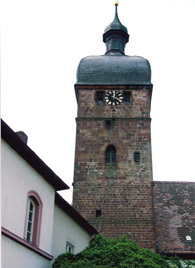 By 1708 the Ferree family obtained their church records from the church in Billigheim. The father, Daniel, is believed to be dead by the time of the letter of passage because he is not mentioned in their passage. It is thought Daniel may be buried either in Steinweiler or one mile north in a small village of Rohrbach. We stopped at both places to ask about older graves and the people told us that after a period of time graves were destroyed and reused. As of now, I have not been to Speyer to obtain his official death and burial records. I hope to do this soon. There was a brief window of opportunity for the Ferree family. After the church letter was issued, May 10, 1708, an entourage of fifty four persons that included the Ferrees, Lefever, and Schleiermachers could have gone either by land or by river. I do know that there was a royal proclamation stating that they would be rejected and sent back if arrived in England after October 1709. If they went up the Rhine to Rotterdam by way of a scow, it would take four to six weeks to reach Rotterdam. I have been reading accounts of the scows going down the Rhine and how dangerous and expensive it would have been. Perhaps they went on foot via Belgium and the Netherlands. We know that the Belgians and Hollanders were sympathetic to the plight of the Protestants in France. This is a "work in progress." Once they got to England they were greeted by other Huguenots in an area of London called Spitalfields where silk weavers lived. They most likely worked in the silk industry there and saved money to come to the Isle of Pennsylvania. My husband's college choir sang at Wesley Chapel Methodist Church for many years but I did not know about the connection between the Ferrees and Spitalfields. The area where the Methodist Church is located is quite close to Spitalfields. When I researched it this summer, I was awed that I have been so close for years and did not know. Interesting enough, William Penn lived only a few streets/roads away from Spitalfields. The area is called Tower Hill. Huguenots in the area knew Penn, recognized his carriage, horses, and persons associated with him and most likely would have pointed him out to the Ferrees. Penn's requirements for purchasing land was that the people were God honoring and had enough money for passage and land purchase. According to our documents, the final paper work to leave France was dated May 10, 1708. Within three and a half months, Marie Ferree had an audience with Queen Anne at Kensington Palace on August 27, 1708. Two years ago I went to Kensington and asked a docent where a person would have had an audience with Queen Anne. When she told me that I had just walked up the stairs and was standing in the very room. I wanted to cry. Marie Ferree would have never imagined that hundreds of years later a relative would be standing in the very place where she spoke with the Queen of England. Daniel Ferree and Isaac Lefever with their families set sail on October 15, 1708, and after an eleven week voyage arrived in New York on December 31st (some accounts say January 1, 1709). It is not certain when Marie Ferree and her four unmarried children sailed but records at St. Katherine's Reformed Church in London show they were registered there in May 1709. It is thought they may have arrived in New York sometime during the summer of 1710. Our sincere thank you and appreciation to Betsy Brooks for her continuing research of the history of the Ferree family in Europe prior to their settling in Pennsylvania. Betsy is a Ferree descendant through the Mary Ferree/Thomas Faulkner line.